Losing Scarlet... Hot New Band! 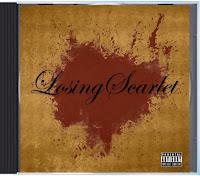 Losing Scarlet are a Chicago based band that have been together about 2 years. They've been growing local support in that time, and have independently produced a fine debut album. Drawing from their influences of modern heavy metal, nu-metal, and Gothic hard-rock; they've developed a tight, signature sound that falls somewhere between Disturbed & Evanescence. Heavy riffs deliver powerful chord progressions, while a soaring female voice delivers the lyrics with equally catchy melodies. The structure provided by the drums & bass make for great foot-stompin', fist-pumpin' grooves. With the recent surge in popularity of metal bands featuring female singers (such as Halestorm, Flyleaf, Lacuna Coil, etc...), it wouldn't surprise me if Losing Scarlet go pretty far in the next couple years. I'll be supporting them on their ascending journey, will you? This band was quite a pleasant surprise in the vast world of myspace-music pages. From the readers poll results, most of you seem to agree. I'm glad I found them, and you should be too! If you haven't visited their page yet, you certainly should. The link to their myspace web site is below. Check them out today! If you're in the greater-Chicago & suburban area, you can probably catch one of their shows- they're always playing somewhere. Order your own copy of their CD today! This time I'm focusing on the band's most recent studio album, the conclusion of their 2-part concept album, Something Wicked Part II-The Crucible of Man. Surprisingly, much has transpired within the band between this album and it's predecessor. The most significant change is that Matt Barlow has returned to the band as lead vocalist, and replaced Tim 'Ripper' Owens (who had replaced Matt prior to The Glorious Burden). It is interesting that this change occurred between two halves of a 2-part concept album. Barlow's return restores the band's classic formula from their late-90's era, a cherished reunion in the eyes of many fans. At the same time, this leaves many hypothetical questions in the minds of Iced Earth followers: What might the "Something Wicked" double-album sound like if Tim Owens had sung on both parts? Or if Barlow had? Fans of Iced Earth will probably be able to debate this issue for quite a while, but it is as is it. Something Wicked Part II: The Crucible of Man continues the plot from Framing Armageddon and the Something Wicked 3-part epic track from Something Wicked This Way Comes. Iced Earth blends melodic clean guitar with rapid-fire thrash riffs throughout this album much like they did on Framing Armageddon. Barlow's vocal range may be a bit more confined to the mid-range than Ripper's was on the first half of this concept album, but it still does not subtract from the overall experience. The concept of an alien race that seems poised to pass judgment on the human race is developed a bit more. Most of the lyrics focus on the nature of humanity; laced with examples of deceit and hypocrisy. 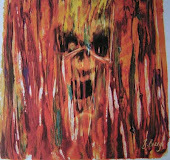 There is a track, "Something Wicked (Part 3)" that musically continues themes from the previous album, as do several other tracks. A melancholy instrumental Epilogue closes the album... Overall, a successful musical endeavor, if a little heavy on its ambition. Avenged Sevenfold have been one of the bands from the modern era of heavy metal that have exceded my expectations in songwriting, technique, and performance. Blending a melodic hard rock vocal style with hard-core punk screams, and fluidly incorporating two excellent lead guitars into some intricate guitar riffs, they've been a perfect metal band in my opinion. Not to be overshadowed, they also had one of the best heavy metal drummers of this generation. On December 28th, 2009, drummer Jimmy Sullivan "The Rev", was found dead at his home. The world of metal will not be quite the same without The Rev's inspired and talented drumming behind Avenged Sevenfold's music. Even beyond his drumming talents, The Rev was also a major contributer in song composition for this band, as well as providing a unique voice for backing vocals. On a few songs on their later albums he even shared some lead vocals. Saddened by this sudden loss of a key member of one of the best young heavy metal bands, I feel it's best to honor The Rev by reviewing more of his band's music. Since I learned of his passing I've been revisiting A7X's music. I've particularly enjoyed watching thier concert DVD, "Live in the LBC". 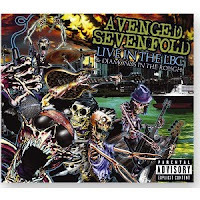 Avenged Sevenfold filmed their performance at the Long Beach Colliseum on their recent tour, for this DVD. It's a great show in front of a home-town crowd, as the band itself is from southern California. Throughout the show you can see how vital The Rev was to their live performances. Particularly on songs like "Critical Acclaim" & "A Little Piece of Heaven", where The Rev sings some key lines, you can really tell exactly what was lost from the world of heavy music on December 28th- not just an excellent drummer, but a truly talented musician.